How to identify and minimize rug cleaning disasters. Rayon is manufactured, regenerated cellulose fiber (cotton and wood pulp by-products). A proper analogy is that viscose rayon is the “sausage” of the fiber world, simply because it is a lot of by-products spun and processed together into staple fiber strands, and you truly do not know what exactly is in it. What we do know is that this inferior fiber presents several problems for cleaners, all of which they need to be aware of. Here are four common challenges to cleaning viscose rugs, and some tips to minimize rug cleaning disasters. Viscose rayon fibers are weak, and the spinning of staple fibers into strands to weave with means that you have a lot of breakage. Regular foot traffic, and vacuuming, will pull loose strands that often look like a cat has used the rug as a scratching post. Avoid scrubbing the rug during the cleaning process. This can keep the problem from getting worse. Soft window washing broom brushes or soft hand brushes are preferable to rotary scrubbing or other rotary extraction tools. Since these strands are already loose, you can charge by the hour to shave or clip the worst areas. This is an additional repair charge. Make sure you point the problem out before the wash rather than after, or you will be doing a free repair. Rayon does not readily hold dye. It fades and bleeds. Cleaners need to do a dye test to see if it is possible to safely clean the rug without ruining it. If the dyes are not colorfast, good results can often be attained using an upholstery tool to surface clean the rug, twice if necessary. Ideally, the cleaner can use a tool that has a smooth Teflon head so that marks are not created with the tool strokes. It is always wise to clean one test area first if taking this route so that you can see the results before attempting to surface clean the entire rug. It is important to have your cleaning and extraction strokes going with the direction of the pile so that distortion is not created. Cellulose fibers yellow when wet, so it is expected that viscose likes to yellow when cleaned. Spills often become yellow areas, and fibers tend to yellow after cleaning. Using an acetic acid or citric acid rinse can assist in lessening the yellowing in the rug during the dry time. Speed drying the rug, or drying it face down, can lessen this yellowing effect on the top side of the rug. The back side, however, will become more yellow over time. 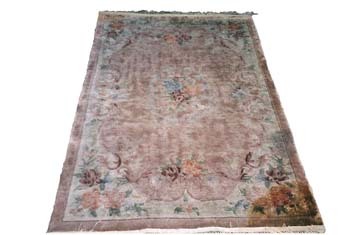 Artificial silk rugs of all kinds can become stiff and matted after the cleaning. This makes the fibers look blotchy and makes the top pile feel like cardboard to the touch. Sometimes a misting of a very small amount of fabric softener (diluted and mixed thoroughly in a sprayer) over the damp fibers prior to the final drying phase can soften the fibers. Hand grooming the rug after it is 100 percent dry can also soften the fibers. This is done slowly, by hand, with a spotting brush or similar short bristle brush. Section by section, the cleaner slowly brushes an area against the grain to help loosen the stiffness, and then slowly brushes the same area with the grain to lay it back in place. Some instructors have recommended using velvet carding brushes for this grooming, but they are often much too aggressive for viscose fibers. Try softer bristle options. It is important that the brush strokes be slow so that you do not break off fibers and cause damage. Because the essence of this rug is trying to find a “cheap” way to create the look of silk, there is a cost to cutting the corners of quality. Viscose rugs are one of the few rugs that look worse with time, and with cleaning. Their best look will be on the day it was purchased. You cannot assume the rug was purchased at a low price because the owner may have been unscrupulously sold it as the “real deal” — silk. Regardless of whether it is real silk, or viscose rayon fake silk, your training in fiber testing, dye testing and pre-inspection skills should help you to know when to take on the job and when to run from it.